Need professional CDR writer help? Get Complete Assessment Report Preparation for Engineers Australia, CPD Preparation, and Competency Demonstration Report, RPL, KA02 Reports by our expert engineers team with 100% Approval Rate. Engineers from all across the world who want to migrate to the nation of Australia have to pass the Engineers Australia (EA) which is the assessing authority or body for selecting engineers for working in Australia. The “Migration Skills Assessment (MSA)” accredits the qualifications from Australia as well as from other countries. It is a full signatory to the Dublin Accord, Sydney Accord or Washington Accord. All the other nations who are not accredited by the Engineers Australia (EA) need to submit the CDR (Competency Demonstration Report). Professional engineers: They generally handle the engineering program and projects for the benefits of the society, government or business as needed. Engineering technologists: They are the specialists of any particular engineering branch and are updated with the latest development in engineering technology. Engineering associate: they are mostly the paraprofessionals in engineering. Engineering manager: They formulate the engineering strategies, plans and policies and direct them in the technical operations. The engineering manager needs to direct the technical staff in starting, pursuing as well finishing the technical projects as per the requirements of the company. What is The Importance of Preparing CDR For the EA (Engineers Australia)? Preparing the CDR for the EA (engineers Australia) gives you an excellent opportunity in showing your competencies and engineering knowledge that match the Australian standards. The CDR reports needed by the technical experts like the Professional Engineers who are appropriately assessed rightfully by the Engineers Australia (EA) team. They also have the best experiences in preparing an error-free How to write CDR report for Australian immigration. This CDR report showcases the ability of the candidate to live and work in Australia. The CDR Australia is to be prepared by a professional team of experts to get it approved by the EA. this is the stepping stone for the aspiring engineers from all over the world to start their dream professional career in Australia. The CDR is to be written strictly as per the EA team gives the instructions and guidelines via their official website. Thus, updated CDR reports are to be prepared by Australian CDR Expert writers as per the EA guidelines. All the relevant documents are needed to be attached with the Sample CDR for convincing the Engineers Australia (EA) team. These can lead to the final CDR selection by the EA assessors. What Are The CDR Document Requirements For Australian Immigration? • The materials prepared d presented by you in the workshops, courses, symposia, etc. • Your studied books, manuals, journals, etc. Writing CDR Engineering Australia is to be followed by the 3 Career Episodes-each focussing on a different career aspect. Each of these Career Episodes needs to be 1000-2500 words in length. This part of your CDR needs to emphasize on the particular problems solved by you in your technical career. Each of the career episodes needs to be properly numbered. Availing a reliable online CDR report writing help can be very much beneficial for you. The Career Episodes need to focus n all the specific competency elements for the occupational category chosen by you. The Summary needs to have a proper reference to all the three Career Episodes in a concrete manner. The Professional CDR Expert Writers At Casestudyhelp.Com Can Guide You In The Best Way. 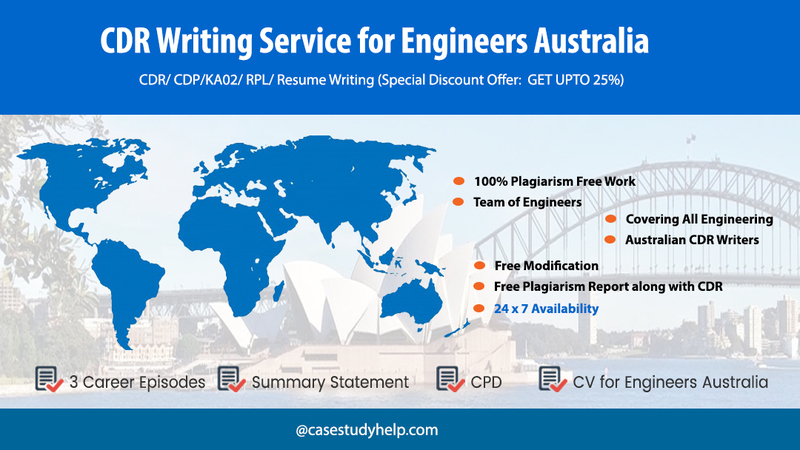 Looking for professional CDR Report Writers for Engineers Australia? If you are looking for the best online CDR Report Writing Services in Australia or any othr location such as: New Zealand, USA, UK, UAE, Singapore, Canada, Malaysia, and India, etc. Then, https://casestudyhelp.com is always the top choice for you. We have the most skilled as well experienced team of Migration Skills Assessment for Engineers Australia experts. They will not only help you in getting your CDR approved by the EA but also assist you in getting your Australian immigration work visa granted by the government. This will lead you to stay and work in Australia as engineers in reputed organizations. We also provide you with the best online Review My CDR Services with the minimum possible service charges. Thus, we can always make the dreams of the aspirin engineers come true with our complete CDR Australia help services towards Engineering Australia. Therefore, register with us quickly to pursue a professional dream carer as an engineering professional in a reputed technical organization of Australia.